February | 2014 | Mike Lamberti, From Margate To Cleveland, And Back ! A busy night of quarterfinal round wrestling at Region 4 in West Orange on Feb. 28 produced some good results for Essex County-based wrestlers. All tolled, 18 from Essex advanced to their respective semifinals, with Caldwell sending five while West Orange and Newark Academy advanced three and Nutley and West Essex saw two of their guys move on. Livingston, Glen Ridge and Cedar Grove sent one each to the semi. There should be a very exciting match on tap at 113 pounds on Saturday morning between familiar opponents in West Orange’s Isaiah Adams and Dean Caravela of Caldwell. The two have met three times already, with all three bouts down to the wire. Caravela won the Essex County and District 13 championships while Adams prevailed in a dual match a few days after the county final. Caldwell’s Mario Pitch and Nutley’s Joe Ferinde were slated to meet in a 120-pound semifinal while Livingston’s Tommy Heller earned a berth in the 126 pound semifinal. Newark Academy had a good night, advancing three wrestlers, including Brendon Seyfried, who advanced to the 132 pound semifinal. Seyfried’s teammate, Steve Bonsall, gained a berth in the 138 pound semi, as did Nutley’s Stephen Scuttaro. West Orange had a good night, advancing three wrestlers to the semis, starting with Adams and continuing with 145 pounder Jordan Velez. At 152, Patrick Gerish of Newark Academy will take on Caldwell’s Ray Iodice in a semifinal bout. Iodice had perhaps the biggest upset of the evening, defeating third seeded Manny Ramirez of St. Peter’s Prep. Glen Ridge’s John Faugno remained unbeaten with a win a 160 pounds and Caldwell’s Joseph Valentino stayed on path for a region title at 170 pounds. Christopher Morgan of West Orange, the top seed at 182 pounds, won his quarterfinal match and West Essex’s Mark McDonald was scheduled to face top seeded Christian Colucci of St. Peter’s Prep in the semifinals at 195 pounds. The 220-pound category featured three from Essex advancing to the semis as Cedar Grove’s Rodney Deprenda, Matt Dignozio of West Essex and Caldwell’s Joseph Bongo all prevailed. Last weekend, I covered the District 13 and 14 championships. I saw Nutley repeat as champion for the third straight year at District 14 while Caldwell won the District 13 crown in a close battle with Passaic Valley. As a Belleville guy, I still despise when Nutley wins at anything, but that’s just because it’s in the blood. I’ve always said I’ll never wear anything with a Nutley Raider logo, but as a grown man, I’ve come to respect good kids and quality coaches, and this Nutley team has both. From the coaching perspective, I am a big fan of Nutley’s head guy, Frank DiPiano. He does it right, plain and simple, and there’s a reason why Nutley, which had never won an Essex County title since the inception of the ECT in 1974 had won back-to-back titles in 2012 and 2013 and now have the three-peat at the districts. Frank comes from a legendary coaching family, led by his father, Michael Sr. The DiPiano coaching tree also includes older brother, Mike Jr., who did a great job for the Nutley girls’ soccer program this past fall as its second-year head coach and is in his third season at Northern Valley, Demarest as that school’s wrestling coach. Middle sister, Michele is an accomplished high school softball coach, as well as a successful elementary school teacher. ‘Joey Ben’ only knows one speed, and that’s full throttle. But as intense as the practices are in the Hornets wrestling room, there’s a compassionate side of this man who wants his athletes to succeed to their fullest potential. And not because it will improve his won-loss record, but the firm belief that wrestling can develop a young man’s character and lead him to success long after his final high school match. While still a young man himself, Benvenuti has been coaching long enough now that some of his former wrestlers have joined his staff. He also takes pride in coaching against former wrestlers, because he is proud to see those young coaches giving back to the next generation of wrestlers. One of my all time favorite wrestling coaches is Caldwell’s Gary Garamella. Gary has been Caldwell’s head coach for about 15 years now. 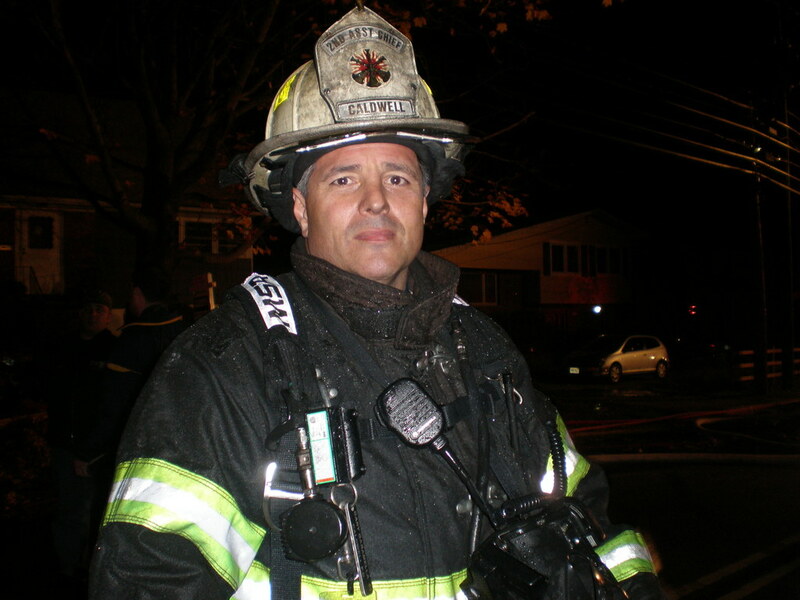 A teacher at Caldwell High, where the school’s moniker is ‘Chiefs’, Gary is literally, the ‘Chief’, since he also holds the top position in the town’s all-volunteer Fire Department. There is never a time when the words class and professionalism haven’t reigned on this man. Despite losing one of its best wrestlers to a serious leg injury at the Essex County championships last month, Garamella led the Chiefs to the District 13 title, defeating Benvenuti’s Passaic Valley team by 10 points. He was also named the District 13 Coach of the Year. In a state with 32 high school wrestling districts, it’s hard to pinpoint one and say it’s unique. But since I’ve been covering wrestling for various newspapers dating back a few decades, there are some nice memories for me at District 14, which is traditionally held at Livingston High School. Besides the wrestling, there’s the usual array of food available outside the gym. Almost all of the goodies are homemade by parents and friends of the school and its respective wrestling program. The people who put it together don’t ask for any fanfare, but I had to say a special thanks to Michele Florio-Campisi, who makes a tremendous macaroni and cheese dish. For years, I’d pay my $3.00 for a nice portion of the M & C. And if you know people from Essex County, we can be particularly snobby when it comes to this dish. 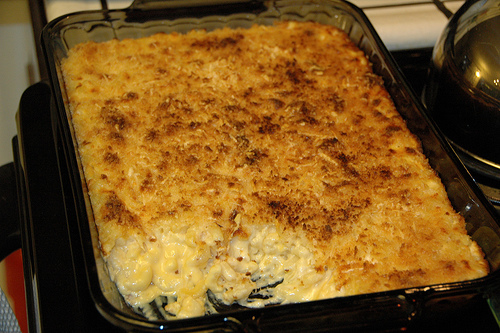 Michele’s Mac and Cheese is awesome ! Bear in mind, I hadn’t seen Michele since last year’s tournament, but she still remembered. Her big heart certainly made my day. Great, I said, figuring I’d get a nice dish of M & C. Instead, she had made me a pretty big tray, and three days after receiving it, I’m still enjoying. According to Livingston wrestling coach Tom Noto, Florio-Campisi is a very important person to the wrestling community in town. The ever-present and hard-working Michele Florio-Campisi. 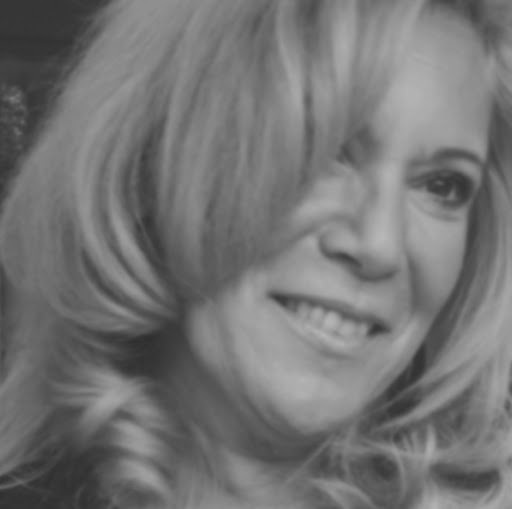 Noto also said that Michele works with special-needs children. So, thanks, Michele, for making the annual day of wrestling at District 14 continue to be special. Can’t wait for next year ! And thanks for all that you do. Long after Pat Trabucco was graduated from Livingston High School as one of the school’s best wrestlers, the memories of growing up and competing for the Lancers stay strong. Trabucco has been out of high school nearly 13 years now. While at LHS, he won four Essex County, District 14 and Region 4 championships, as well as capturing four NJSIAA medals, including a second place finish in 2001 and a third place finish as a freshman in 1998. Trabucco later served as head wrestling coach at Livingston and today, along with good friend Matt Kirspel, helps run the recreation wrestling program in Livingston. I usually run into Pat every year at the District 14 championships, since they’re still held in Livingston, so it was no surprise to see him this past weekend, along with Kirspel. And it takes about 30 seconds (maybe less) to get him started on some of the characters who wrestled in his era, as well as the toughness in the current group of grapplers. Kirspel, who finished among the top wrestlers in the state in his senior year, agreed. Trabucco also recalled a time, in his freshman year at Livingston, when he nearly went at it with his coach, Bob Keenan, during a drill. Keenan and Trabucco are close friends to this day. Trabucco, along with other high school wrestlers from the late 1990s and early 2000s, also noted that with social media, a lot of current high school wrestlers are much closer now. Ratel, who coaches at Bloomfield now after a tremendous scholastic career with the Bengals from 1993-1997 and Conte, who was a coach at Belleville for a decade after a tremendous high school wrestling career at Belleville, from 1994-1998, actually became friendly, but it took at least 10 years past high school for that to happen. Joe Dubuque and Anthony Montes were a different story. 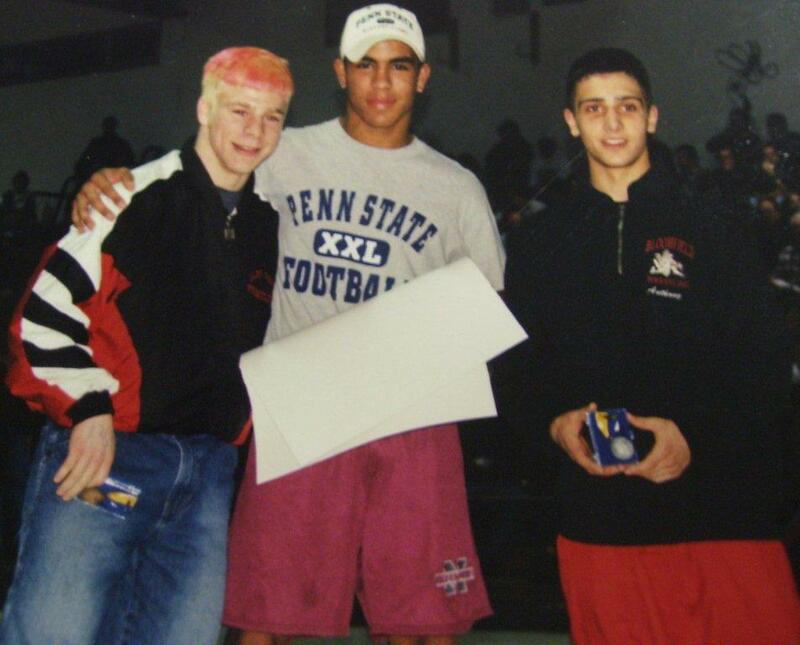 Dubuque, a 2001 graduate of Glen Ridge and a close friend of Trabucco and Montes, a 2002 Nutley grad, would have some tremendous matches against each other, but off the mat, the two of them were best friends, which remains to this day. Montes also noted the camaraderie, plus the intensity. 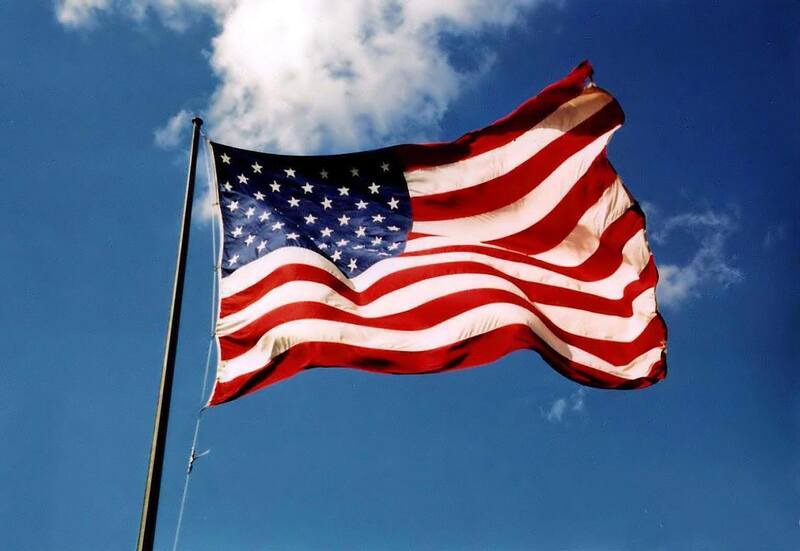 We all have our stories of where we were on Sept. 11, 2001, so there’s no need to bore you with mine. But having worked across the street from the World Trade Center for over a year prior to 9-11, I can safely say I grew attached to that area of Lower Manhattan. So, anytime there’s a milestone in the re-development of the site, I feel like I should be there. 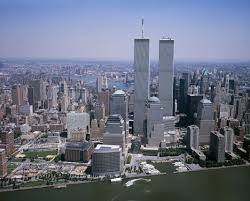 Who could ever forget these two great buildings ? My first trip to the site after the attacks came in November of 2001, and the devastation was overwhelming. I remember seeing the site, with the smoke still billowing and the water spraying the embers from across the street. There was such an eerie silence to that day, even though a lot of people were there that Friday morning after Thanksgiving. A lot of them stood and cried. Many watched while talking to police officers, and the sentiment was so positive toward the NYPD. Some tourists would ask to have their picture taken with an officers. Others just shook hands with them and said thanks. The new PATH station at the World Trade Center has a gorgeous new platform. 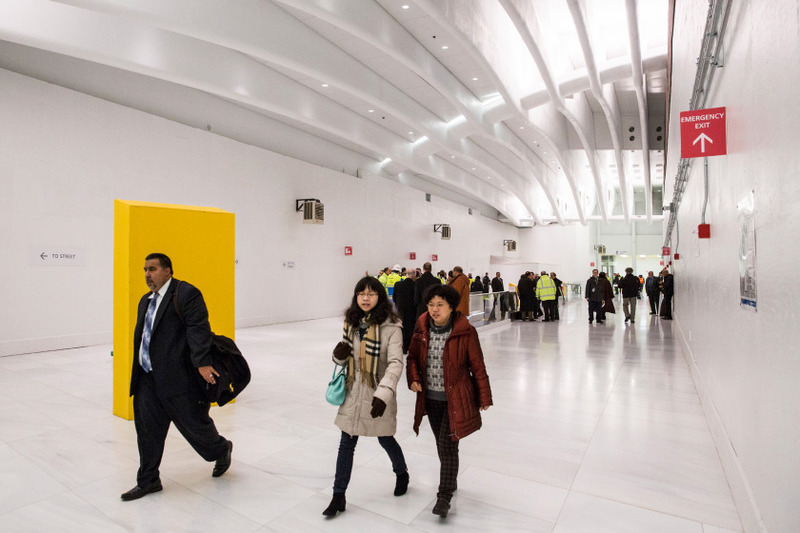 State-of-the-art platform at the PATH Station of the WTC, opened on Feb. 25, 2014. While the site was indeed a work-in-progress in not only cleaning it up, but respectful in that remains of victims were still being recovered, there was also a lot of hustle and bustle in the immediate blocks around the site. Tee-shirts, statues of the WTC and other artifacts were being sold and there was plenty of people there. Hey, it’s New York. The World Trade Center Memorial Site. Quite stirring. We’ve all seen the great things that have happened there since late 2001. I remember taking the first PATH train back to the WTC site in November of 2003. 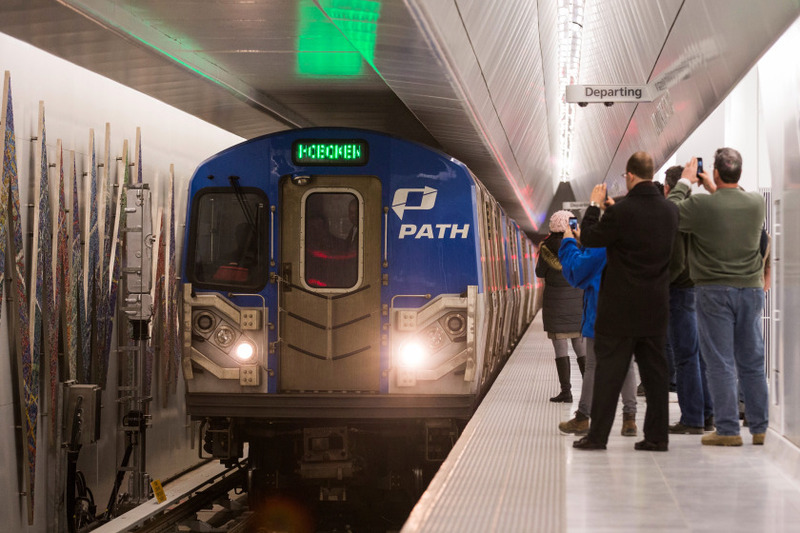 That event came to mind today as the PATH station at the WTC unveiled a new platform. The place looks beautiful and I can’t wait to go visit soon. When the WTC officially became the tallest building in the United States, I couldn’t help but visit. When the sphere was added to the top of 1 WTC, I had to go. 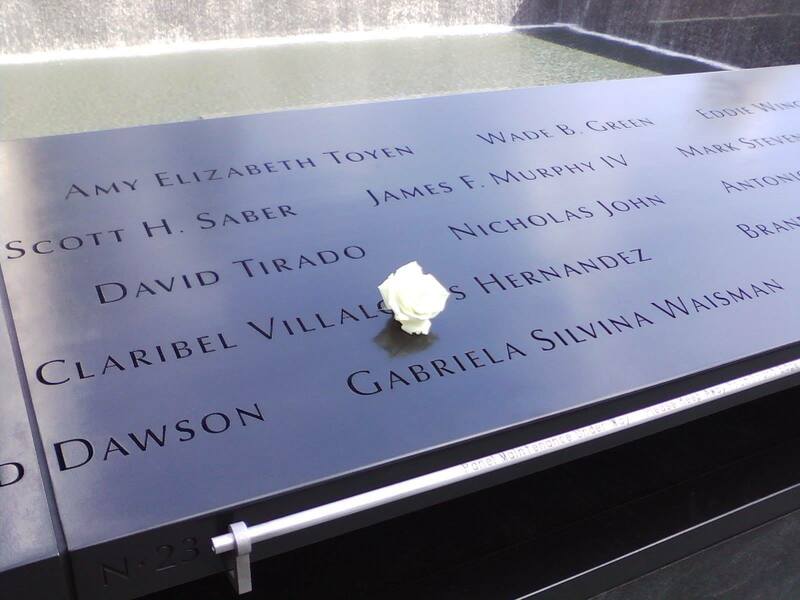 When the WTC Memorial opened in Sept. of 2011, I was there the first month it opened and have returned numerous times to visit. It’s quite a site. 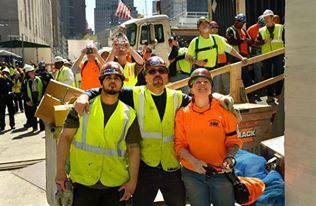 Some of the workers at the WTC site watching the sphere placed on top of 1 WTC last spring. The rebuilding of the site in Lower Manhattan is a testimony to the spirit of our great country. 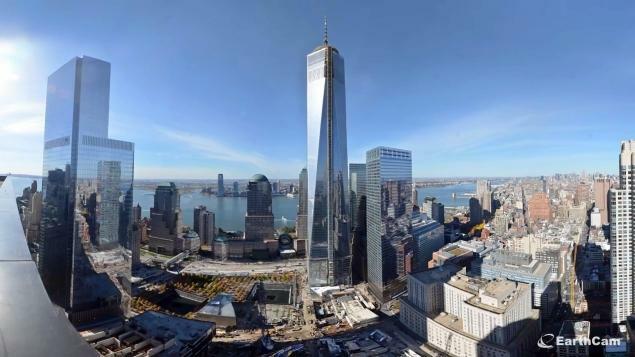 Pretty soon, the World Trade Center buildings will all be thriving with tenants. A new generation of people will inhabit the area, but we should never forget those who worked there and didn’t come home on Sept. 11, 2001. Having done my share of writing for nearly 39 years, I will admit there are a few stories that resonate for a lifetime. When it comes to high school wrestling, there is, by far, one which stands out. It happened 13 years ago and comes to mind specifically this weekend, as the Region 4 championships are once again contested in Northern New Jersey. Long after the final whistle sounded, and the cheering ended on a wrestling mat in North Jersey, three friends remain tied to each other, in part due to a weekend 13 years ago that will forever bond them. It’s what makes high school wrestling, and its subsequent competition, so special. And while the friendship amongst the three had begun long before a fateful weekend in March of 2001, what occurred over a seven day period 13 years ago has forever changed their lives. It’s a story of courage, raw emotion and the ultimate victory which would alter Dubuque’s life and strengthen a friendship already cemented in respect. On Friday, March 2, 2001, Dubuque won his Region 4 quarterfinal at Passaic Valley. Already a three-time region champion, he was scheduled to wrestle Messina, then a sophomore who was just beginning to gain credibility in the sport, the following morning in a semifinal. He was also excited about having just set a new state record for takedowns in a season, eclipsing the mark of 204 by perhaps the best high school wrestler, ever, in New Jersey, Damian Hahn of Lakewood. With Dubuque off to a doctor, the buzz around Passaic Valley was deafening. I remember calling my editor at the Star-Ledger, Bruce Moran, seconds after the injury to inform him that Dubuque might be out of the tournament. Moran had already set up ‘art’ as we called it, meaning Joe would be featured on the front page of the special supplement. Dubuqe and Montes had hoped to wrestle each other in a state championship final in 2001. A year earlier, Montes had made it to the 112-pound semifinals before losing and eventually finishing sixth in the state. Dubuque, who was wrestling in the other semifinal that year, went on to win the state championship at the Meadowlands. 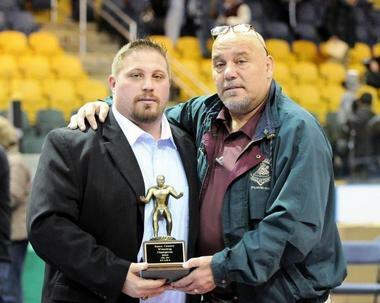 Montes would go on to earn a third state medal in 2002 and today is the assistant wrestling coach at Nutley High. The Region 4 seeding meeting at West Orange High brings the usual committee of coaches together for a morning/mid-afternoon of arguing, laughing and, ultimately, deciding the seeds for the upcoming wrestling tournament. The committee regulars include Nutley coach Frank DiPiano, Passaic Valley’s Joe Benvenuti, Mike Settembrino of Becton, North Bergen’s Jerry Maietta and the legendary (Uncle) Eddie Roselle from St. Peter’s Prep. While Uncle Eddie is the assistant coach, he’s THE MAN, in these meetings and his arrival was greeted with a thunderous ovation. Roselle’s sense of humor is classic. 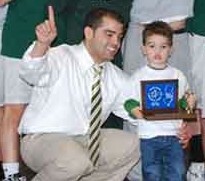 In 2010, as Frank Cagnina of Queen of Peace was en route to winning a third state championship and breaking Mike Grey’s state win record, Roselle, in a serious tone, looked up at the board, saw Cagnina seeded first and said ‘Why Cagnina’? (as the top seed). The only question this year is which wrestler will get the ‘Why Cagnina’ vote from Uncle Eddie. So, it’s about 9:15 a.m. on Feb. 24, and the meeting has its usual disarray of organization, but it’s all good. Anthony Verdi, the head coach at St. Peter’s, sends a text, asking if Uncle Eddie is behaving. He also said he hopes the meeting will be over in five hours. Good luck with that, I said. The over-under of when this meeting will conclude is anyone’s guess. I’m saying 3:30 p.m. would be ideal. If West Orange coach Stefan Zichella starts ordering pizza around noon, then the meeting still has plenty of time left. For the avid high school wrestling fan, these are the best two weeks of the season, with the regions this week and the NJSIAA championships on March 7-9 at Boardwalk Hall in Atlantic City. It’s a Bruce Moran kind of setting, for sure. Stay tuned. I’m sick of it, and I’m sure most of my loyal readers are, too. 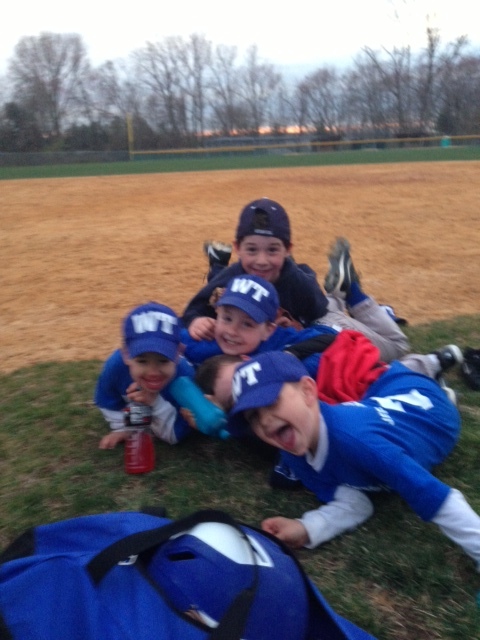 So here’s a little baseball talk, starting with kids playing and having fun. My pal, Rob Carcich and his wife, Lauren, have twin sons, Robbie and Michael, and both kids are crazy sports fans. They live and die watching their dad coach the Passaic Valley High School boys basketball team. 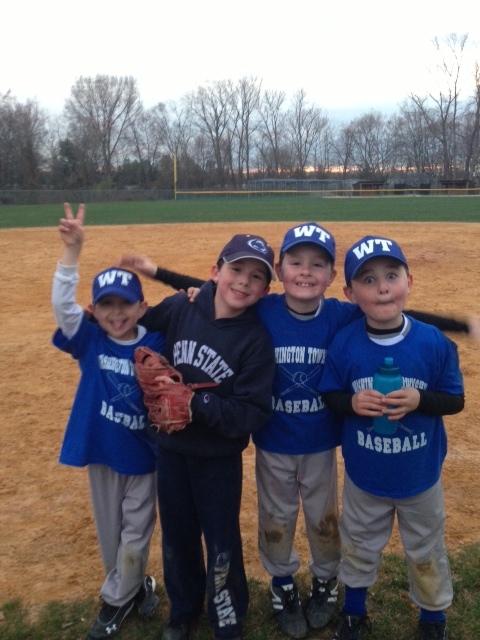 When they’re not rooting for the Hornets, the youngsters are involved with multiple sports in their home town in Upper Bergen County, NJ. Seeing the looks on their faces while playing baseball in warm weather (yes, there is such a thing as warm weather in Northern New Jersey), should give us all hope that in a few months (maybe less), we’ll see a lot of youngsters like Robbie and Mike on a baseball diamond, playing the game we all love. I can’t wait for opening day in Major League Baseball. I’m told it’s just six weeks, or so, away, but I can’t believe these glaciers that dominate most of the landscape where I live will be melted in time to play ball. But, I’m guessing it will happen. Nature has a way of taking care of that stuff, right? With that said, Go Cardinals and Go Rays ! On to high school, I’ve been a big fan of Essex County softball for many years. April 1 is the traditional opening day and I can’t wait for the drama that is Essex softball. There will be the intense games featuring schools like Mount St. Dominic, Nutley, West Essex, Caldwell and, of course, the Big Green Machine in Livingston. I’ll have my usual race horse analogy for those ‘studs’ like Kylie McLaughlin of Livingston (Seattle Slew) and Nutley’s Carly Anderson (Spectacular Bid). 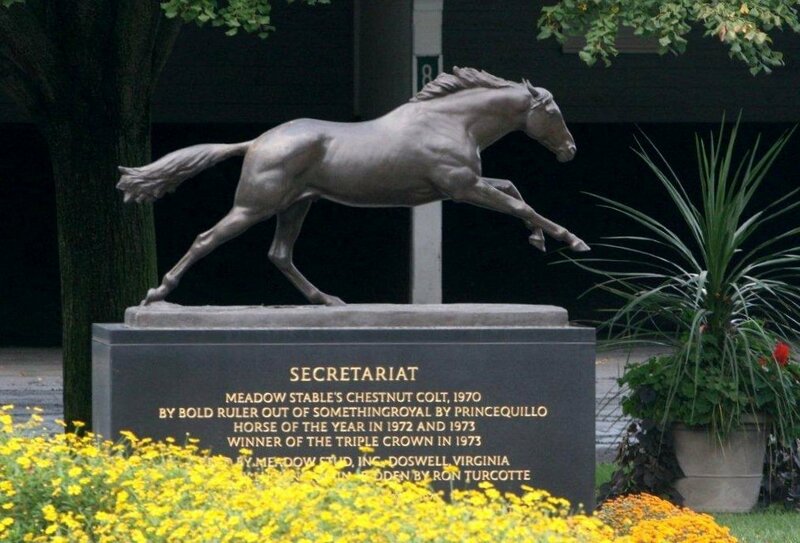 While Secretariat is retired from the high school circuit but is now playing at Hofstra University, there will be plenty of good players to watch this spring. (Sadly, no more popcorn analogies, but then again, you never know). Secretariat may be retired from Essex softball, but her fastballs are alive and well at Hofstra. Livingston coach Jason Daily hopes to get doused with another championship in a few months. 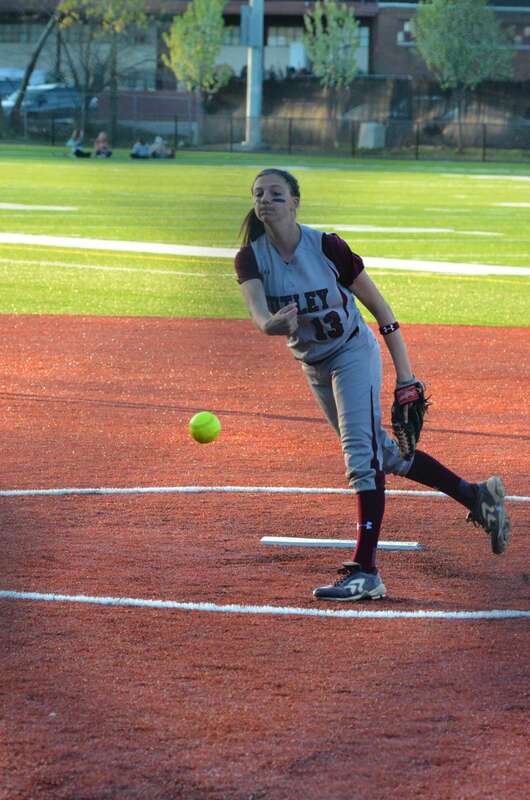 Carly Anderson of Nutley, a stud pitcher for the Raiders. 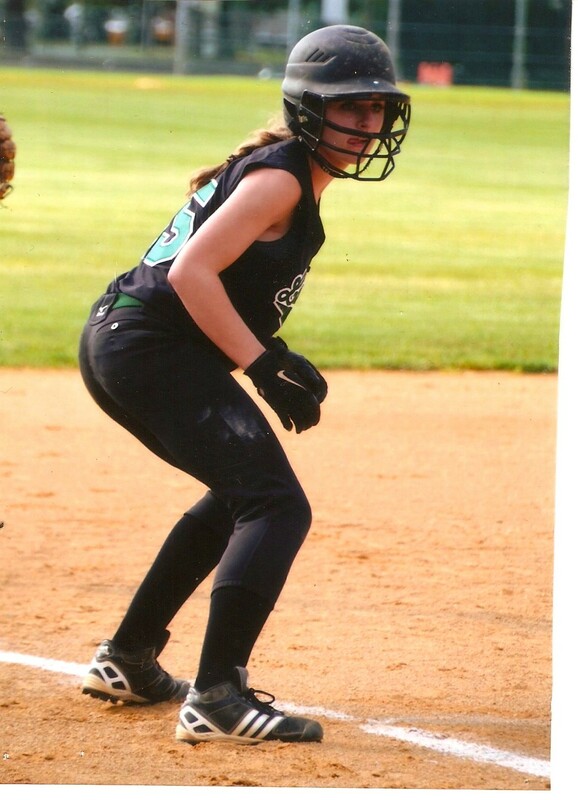 The returning stud outfielder and leadoff hitter at Livingston, Kylie McLaughlin. I still think Livingston is the team to beat, but you have to like The Mount, with some talented pitchers returning, Nutley, with Spectacular Bid in the circle, Caldwell, with hopefully their wonderful young pitcher healthy and ready to go, and West Essex, who I think may be the surprise team in the Super Essex Conference. Andrea Mondadori’s team is always in the mix, but I think this team could be her best since the 2010 squad won a sectional title. We shall see. 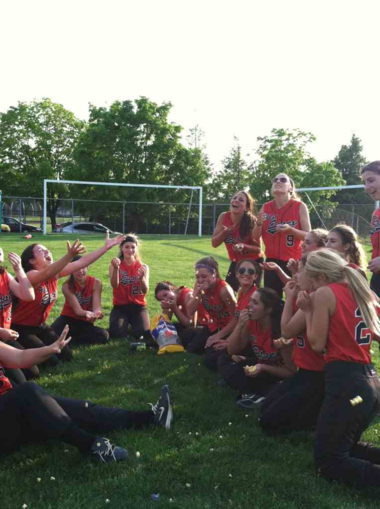 West Essex players hope to be eating plenty of popcorn following big wins in 2014. 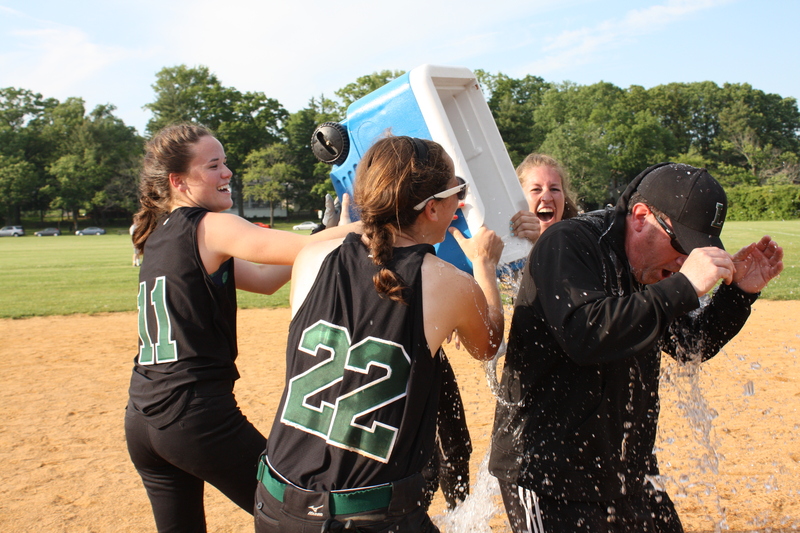 Softball also means a few months of comedic relief from Immaculate Heart Academy coach Anthony LaRezza. Whether we’re talking about old time umpires or classic Soprano lines, there’s never a dull moment with IHA’s leader. 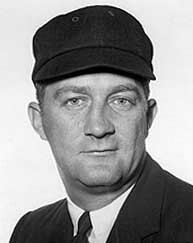 Former MLB umpire Nestor Chylak is a legendary figure at IHA. 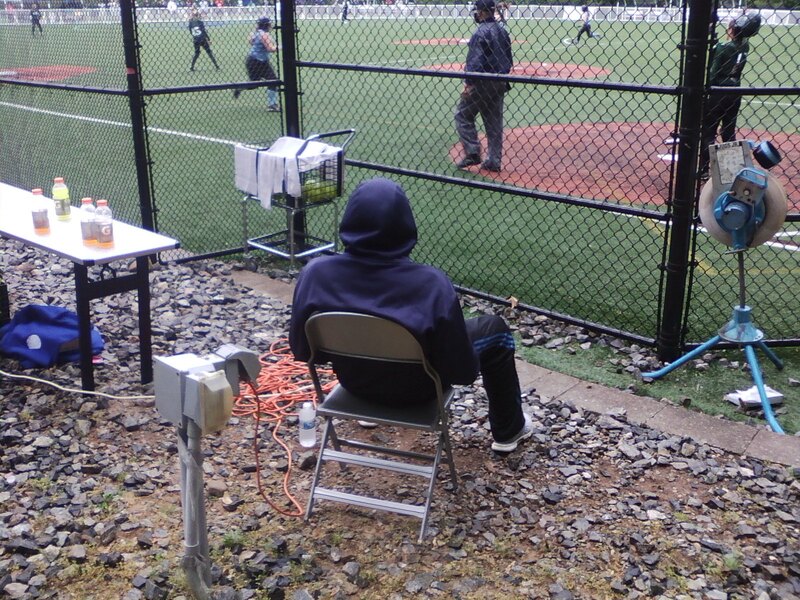 LaRezza ‘relaxing’ during a recent Bergen County Tournament game. And finally, it’s less than 15 weeks until Memorial Day weekend. 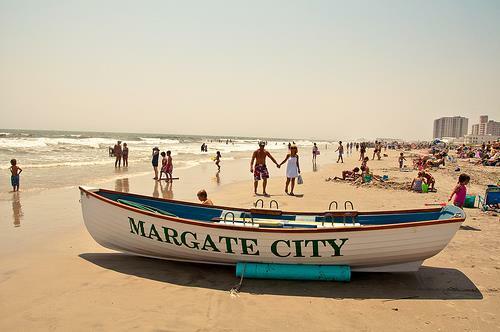 I don’t care if it’s snowing that weekend (heaven forbid), I’ll be in Margate, NJ, that Saturday, May 24, with my beach pass and chair, in tow. I’m ready. End of story there. Can’t wait to plop that beach chair at my favorite location on the Jersey Shore. Think warm thoughts and hopefully, it will come true soon.